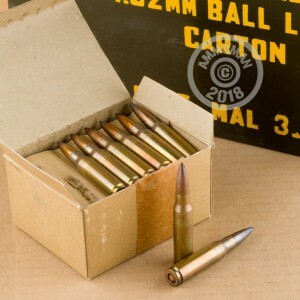 These Malaysian-made 7.62x51mm, L2A2 cartridges are a perfect choice for range practice with semi-automatic FALs and CETMEs as well as appropriately chambered bolt-action rifles. 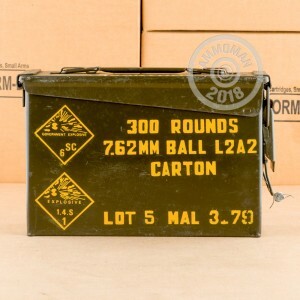 Each 300-round pack ships for free in its own .30 caliber can! The military-style ammo can is made of steel and features a locking latch, rubber seal, and foldable carry handle which not protects the rounds from shock and moisture, but makes them easy to stack in an emergency stash room. 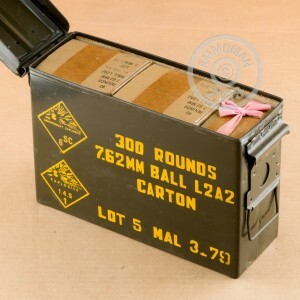 Inside the can is one 20-round box and seven 40-round boxes. While this ammo was produced in the 1970s, it comprises select components which ensure dependable function in modern firearms. Each round was made using a brass casing that was annealed at the top for accurate, consistent crimping and safe operation. The cartridge is crowned with a 146-grain FMJ bullet which feeds reliably and flies true. This particular FMJ uses a bimetal material which is magnetic and may not be cleared for us with some indoor range businesses. The cartridge is ignited by a non-corrosive Berdan primer which is tri-staked and bordered by sealant all the around its circumference. This arrangement protects the round's powder and prevents primers from falling out and causing catastrophic malfunctions.